Peggy Baker Park is located in Crestwood off of Abbott Lane behind the Heritage Place neighborhood. Over 15 years ago, Peggy Baker Park opened for families in the surrounding area to enjoy with multiple baseball fields, a playground, picnic shelter, and practice fields for soccer, football and lacrosse. After many years of enjoyment, the park is in need of an update. Walking Path: A paved path will loop around the popular play areas of the park and will be over a third of a mile long. The path will rise and fall with the natural lay of the land and will have benches throughout to rest and take in the beauty of the park. Dog Park: Oldham County dog owners will have another in-county dog park to enjoy a day outside with their dog. The large fenced green space will feature a water fountain with a dog bowl, two shade structures and separate small and large dog areas. New Playground: Children of all ages will enjoy a new playground with plenty of climbing, swinging and sliding opportunities. The playground will have access for all via an ADA-approved walkway. Your help is needed to make this project happen. Click the button below to pledge your support! © 2016 Oldham County Greenways Inc. Improvement costs are estimated to be $200,000 and Oldham County Parks and Recreation and Louisville Paving and Rogers Group have committed generous amounts. We are very thankful for their financial contributions to this project, but we still need your help to reach our goal! 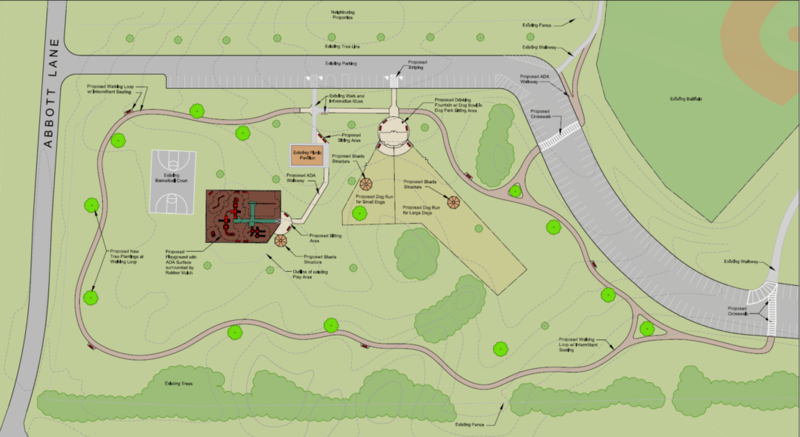 You can visit our site plan below and please consider making a tax-deductible donation to Oldham County Greenways so we can invest in Peggy Baker Park and our community!